The Missouri Botanical Gardens is one of the world's most well known and prestigious botanical gardens featuring plants from all over the world. It is a National Historical Landmark of the United States and there's no wonder as to why! The Missouri Botanical Gardens is an institution that goes far beyond a city garden; It conducts botanical research worldwide, maintains an enormous herbarium (preserving millions of dried plant specimens) and collaborates with universities across the globe. The gardens are a great experience for anyone with any interest in botany or plants what so ever. There's something to please every kind of plant lover. Some notable gardens include the Victorian Garden, Japanese Garden, Chinese Garden, Bulb Garden, Iris Garden, Gladney Rose Garden, Dwarf Conifer Garden and Rock Garden. Although I found the large variety of gardens to all be very fascinating and beautiful, my favorite exhibits were obviously the greenhouses. There are three main greenhouses, the Linnean House, Climatron and Temperate House. The Linnean House is full of various cacti and succulents, but its main attraction is the camellias and fragrant plants. 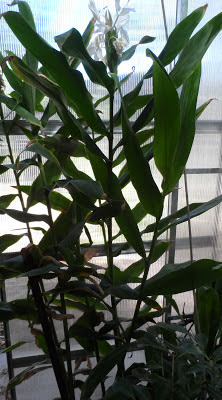 Wandering around this house, it is easy to get lost in the smells.There are many citrus trees and camellias which fill the house with fragrance. It is quite pleasant comparing the sweet scents of the numerous camellia varieties. There was one thing, above all else that I wanted to see at the gardens and that was the Climatron. It has a ground surface area of 24,000 sq ft., and houses over 1,500 plants. Boasting a low profile this massive domed greenhouse is nearly hiding in the hills and flora of the gardens. Upon entering you are welcomed with barrage of warmth and moisture to the tropical paradise that is the Climatron. After a short amount of time following the trail you are completely submerged in jungle and it is often quite difficult to see the walls of the dome itself. I praise the gardens for such an amazing piece of botanical engineering; the density of flora inside the Climatron is remarkable. The Climatron houses many epiphyte displays utilizing the thick trunks and branches of trees. Most of these are combinations of orchids, bromeliads, ferns and Spanish moss. One of the most abundant edible fruits in the Climatron are bananas, they seem to be scattered about throughout the greenhouse and many were fruiting and in flower. The Climatron has unique exhibits of tropical life including an Amazonian aquarium, epiphyte forest, and agricultural trail. Several species of birds inhabit the greenhouse giving the unique and authentic feeling of a jungle. Of the edible and exotic plants my favorites were the double coconut tree (Lodoicea maldivica), bananas, sugarcane, various gingers, chocolate tree (Theobroma cacao), Brazilian grape (Myrciaria cauliflora), star fruit, star apple, vanilla orchid. There are also many tropical plants with medicinal value, the Neem tree (Azadirachta indica) and Betel (Piper betle) to name a couple. I thought the temperate greenhouse was quite amazing as well. There is a large area devoted to pitcher plants, mostly North American pitcher plants from the genus Sarracenia. There are a number of edible temperate plants found in this greenhouse, they include fig, grape, pomegranate. Some other notable plants include tea (Camellia sinensis), absinthe (Artemisia absinthium) and many other herbs such as rosemary and thyme. The Botanical museum and library founded in 1859. Henry Shaw founded the gardens in 1859 and his spirit lives on through the gardens' historic architecture. Another great garden I visited was the Japanese garden. This garden features a large lake with several islands. All in all, the Missouri Botanical Gardens is a priceless experience for any one! It's a great place to learn more about plants from around the world or to simply have a nice relaxing day outside.